I modelled, animated and rendered "The Zootus" in Alias Power Animator. 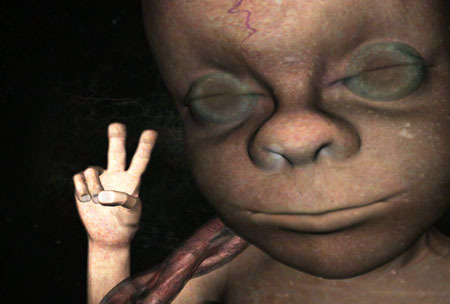 As a use of 3D animation in a show opening, I think that a finger-spelling fetus is a nice change of pace from all of the 3D text that we see in so many programs. Rick Austin proposed the idea, and he and Josh Greenberg supervised the project as I created the graphics at Palomar Pictures. This is what the model looked like on the screen of the SGI. The Zootus is built entirely out of NURBS. The green things are the camera, lights, and particle emitters for the fluid. I modeled him in multiple levels, so that you could see through translucent flesh to internal organs. As you can see below, his translucence matters a great deal at the end of the animation, because he makes eye contact with the camera, even though his eyes remain closed. The opening sequence was rendered in 18 layers, and composited together at 525 Post Production, with Flame artist Glen Bennett. 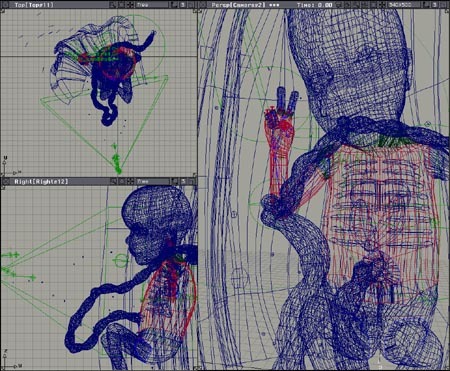 Since each element, such as the head and the umbilical cord, was rendered separately, little tweaks like softening the edge of the head (see where it covers the umbilical cord) were possible in compositing them together. Also, I shot one live-action plate of water with added couscous in a fish tank, which nicely complemented the eight other layers of particles that were rendered in Alias.